What is an Intelligent Opening? As a person goes forth on the day to day grind, it’s easy to forget how often we pass through all kinds of openings. It starts with leaving your bedroom, eventually walking out the front door or garage door and so forth. But how often do you pass through an intelligent opening? What is an intelligent opening? Simple. An intelligent opening is any kind of access point to a facility, internal or external, that assists in controlling the traffic going through them. 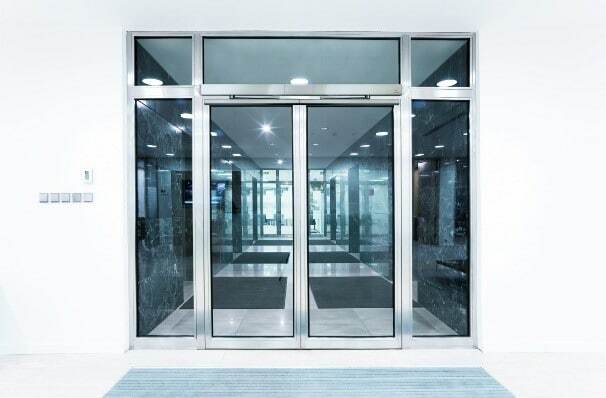 In a facility that has many employees entering and exiting all the time, automatic doors and turnstiles are a great option, seeing that they allow for many people to pass through quickly. These two make a great combination since the automatic doors don’t necessarily provide access control, and a turnstile itself doesn’t provide an entry way into the facility. 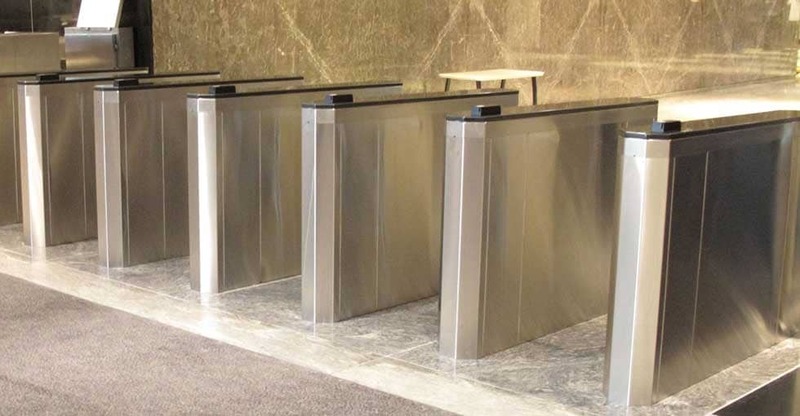 With the credentials of your choice, and at your facility’s convenience, the turnstile works with your automatic doors to help streamline the entry process for the employee. Your security or front desk team can focus on their main job and greeting visitors. Let the intelligent openings take care of the rest. Regardless of your facility’s size, there are places you don’t want just anyone to be able to access, regardless of their affiliation. This is where mechanical and electromechanical hardware shine. There’s a lot of versatility with either type of hardware. They can be applied in single door access control to hundreds of doors with access control, all to be used with the credentials of your choice. Essentially, the goal with an intelligent opening is to improve the physical security of buildings and facilities based on their needs. This allows access for the people you know. At Kenton Brothers, we specialize in creating solutions to meet these needs. We take pride in what we do… securing people, properties and their assets. https://kentonbrothers.com/wp-content/uploads/2018/09/Kenton-Brothers_Intelligent-Opening-02.jpg 398 606 Alana Hanley https://kentonbrothers.com/wp-content/uploads/2017/10/Kenton-Brothers-Logo.jpg Alana Hanley2018-10-03 06:00:472018-09-27 09:24:40What is an Intelligent Opening? Part 1 – Do we eat our own cooking? How the experts approach physical security. 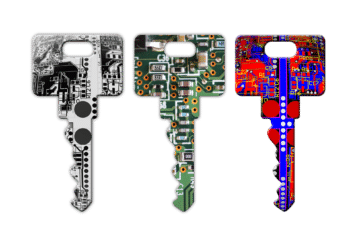 Part 2 – How does a security integrator design their own security systems? 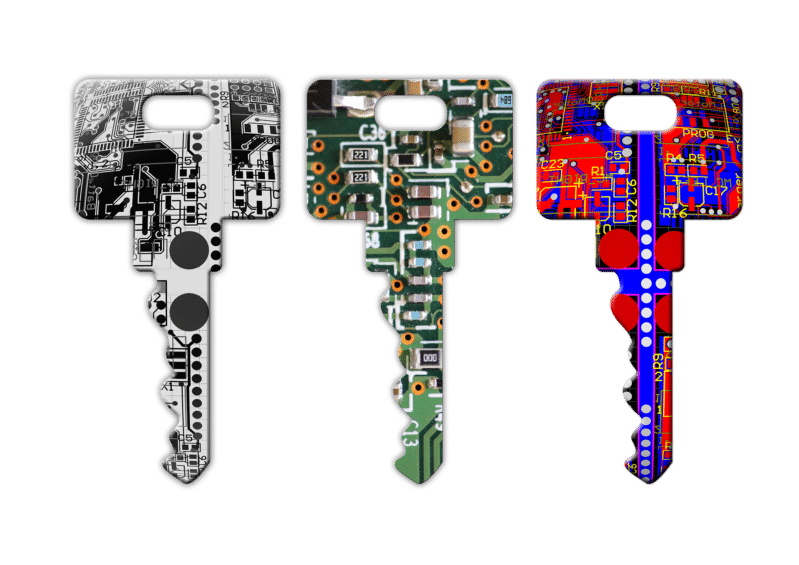 Part 3 – How does a security integrator design their own security systems? In the last couple of months, we’ve been designing our intrusion system, network infrastructure, and video surveillance systems. Now it’s time to design the access control system. There can be lots of advantages to Access Control. Track who goes where, etc. Use access control doors for business reasons, not just for security. First, let’s talk about the components of access control. A couple of the components are obvious, but others are misunderstood. Today we’ll talk about card readers, locks, door position sensors, request to exits, and credentials. Exciting, right? Maybe not, but these are incredibly important details for a commercial security system. Card readers are the most obvious component required in an access control system. The card reader is what reads your access control card and identifies you to the system. Your card is unique to you within your access control system. However, a card reader doesn’t have to be just a card reader. There are lots of ways to identify yourself to the system. Fingerprint readers, vein readers, pin pads, iris scanners, and face scanners are all possible ways that you could be identified. Some of these are more secure than others. Pin numbers can be shared, so we highly suggest not using them, or make sure that whatever you have behind the door is not valuable. Fingerprint readers are more hackable (YouTube Video about that here) than a vein, iris or face scanners. The highest level of security is two-factor authentication. You would use two of these kinds of credentials to enter the door at the cost of being less convenient. Locks are the next most obvious component. You need to be able to lock and unlock the door electronically. Common electronic locks are Electrified Panic, Electrified Levers, Strikes and Mag (magnetic) locks. 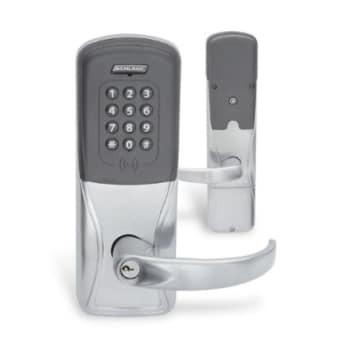 All electronic locks can be broken into two categories, “Fail-Safe” or “Fail-Secure”. Fail-Safe locks unlock when there is no power going to them. When the power “Fails” the lock is “Safe”. In this case, “Safe” means someone can get out. Unfortunately, that also means that the door is unlocked, so someone could come in if the power fails. Fail-Secure is the opposite; when the power fails, the lock is secure or locked. There are times when codes require a Fail-Safe lock, like in a stairwell of a large high rise, however, at Kenton Brothers we prefer fail secure locks. Electrified Panic, Electrified Levers, Strikes can all be Fail-Secure or Fail-Safe, but mag locks are always Fail-Safe. Mag locks usually require two forms of egress, meaning that there are two ways to leave the building through a mag lock. Mag locks generally are also required to be connected to the fire alarm. Although Mag locks themselves can be cheaper than other types of locks, by the time you connect the two forms of egress and the fire alarm, you could have installed a Fail-Secure lock. Now you can authenticate at the door with a reader and unlock the door with an electrified lock. But how do you know if someone propped open the door, or forgot to shut it? That’s where the third component at the door comes in, the door position switch. This switch is generally a magnetic switch mounted in or on the door that tells the system if the door is open or closed. You can use this information to drive alerts if a door is left open too long, which circumvents the security that you are trying to establish with access control. Wouldn’t it be nice to know if someone opened the door that was unauthorized? With the door position switch, we can tell the door opened without a card read, but it would also alert us when anyone leaves the building. We use a second type of switch to tell us when someone is leaving the building called a “Request to Exit”. This can be a motion detector that triggers when someone gets near it, or it can be built into a lever or exit bar. That way, if the doors opens, but the request to exit was not triggered and the reader was not used, we know someone came in from the outside and was not authorized. This is called a “Door Forced”. The door was forced open with key or crowbar. The last component is a credential. We say credential, not card, because we can use a key fob, iris, face, fingerprint or other identifying feature to authenticate to the system. Most systems use a card or key fob, because of cost and ease of use. However, not all cards and key fobs are the same. 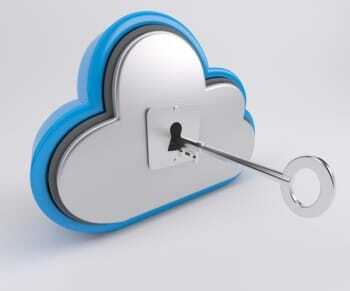 There are dozens of technologies that can be used to store and transmit the credential number to the system. Some are proprietary, some are open, some are not-encrypted and some are. Generally, we advise clients to use a “Smart Card” technology that is encrypted, but not proprietary. It provides the security of encryption while allowing the technology to be compatible with most access control systems. Some options even guarantee that your exact credential number will never be available to any other company in the world, while also being non-proprietary and encrypted. So What Will Kenton Brothers Be Using? Whew, that was a lot of info! Now let’s talk about the solution we’re going to use at Kenton Brothers. Our exterior doors need to be secure, while some of our interior doors are really just for traffic control. We will control our space while also controlling the tenant space. There’s an overhead garage door leading from our space to a space shared with the tenants. We also have an overhead garage door for loading and unloading material that we don’t want to have to get out of the truck to open. For the exterior doors, we’ll install an electrified exit bar with a built-in request to exit. The exit bars are heavy duty and allow a large number of people to get out of the building. The built-in request to exit also gives less false triggers than motion detectors, because instead of triggering when someone gets close, it only triggers when someone actively leaves the building by presses the bar down. These doors will also get a door position sensor. The interior doors will be strikes or electrified levers. Although these locks are still rated as “Heavy Duty” they are a little less expensive and won’t see as much use. We will still use request to exits in the electrified levers, for the same reason as the exit bars. We’ll still use a door position sensor to make sure the doors are closed. The overhead doors will be controlled by door operators, kind of like your garage doors at home. We’ll tie those into the access control system. 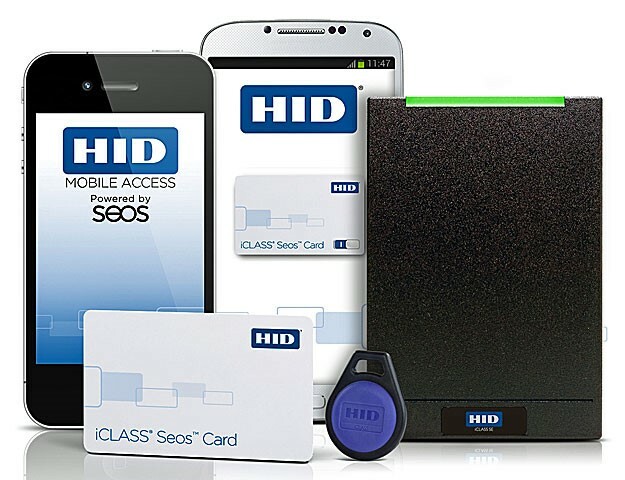 For the readers, we’ll use HID iclass SE. These are non-proprietary, encrypted readers, which can also be used with Bluetooth credentials. Right now, they will connect with the Weigand protocol, an open standard communication between readers and access control systems. They can also use a newer, more secure OSDP protocol when the access control systems are ready. For the long range reader at the exterior overhead door, we’ll use a Nedap reader that can read a special credential at distances up to 33 feet away. That way, the door can be opened without leaving the comfort of the truck. Thanks for joining me on this physical security journey for our new building. We are really excited to create a showpiece of security layers and technologies. Please stop by this summer to see everything we’re integrating to create a holistic security stance! How does a security integrator design their own security systems? 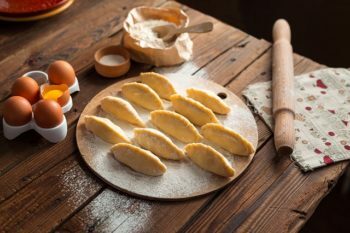 Most people are familiar with the phrase, “Do you eat your own cooking?” This is a casual way to ask a company if they implement the same products and services they’re selling their customers in their own business. I think that most companies do a far better job of providing their services to their customers better than they do for themselves for lots of reasons. But the most common reason is that they’re too busy doing a great job for their customers. They just don’t have time, because the customer comes first… right? Over the next couple of months, we have the opportunity to do it differently. Since we are moving into a new office, we can design our systems from the ground up. It’s an opportunity to showcase what’s possible in a real world application. Today, we’re going to be looking at an intrusion system, also known as a burglar alarm. Our new space is a much larger building. (Yay!) We will sublease space to at least one tenant, but maybe more. There are office, warehouse and common spaces with lots of windows and overhead doors. How do we protect the different areas of the building? How do we do it as cost effectively as possible? The first issue can be solved by many different alarm manufactures, most of the larger systems have a feature called areas, or partitions. Areas allow a keypad and related sensors to act as a self contained alarm system. It’s also possible to have a “Common” area that disarms with the first related area and arms with the last related area. Honeywell provides a good explanation of a common area here (PDF). We will have multiple areas defined that can monitor our own space, the tenant space and any common space that’s shared. We just need to make sure that the panel we choose will have enough partitions for future expansion. Next on the list to tackle is how to protect the different areas. We will certainly need to place door contacts on all the doors into the various spaces, but the type of contact and how they’re wired is important as well. To maintain the aesthetics of the personnel doors, we’ll use recessed contacts that are only visible when a door is open. They also come in different colors to closely match the color of the door frame. We can help protect damage of the overhead door contacts by providing rail mount door contacts, which keep the contact higher and out of the way. One example is an interlogix 2300 series. Motion detectors come in all shapes and sizes, but using a motion detector with multiple technologies keeps the false alarms at a minimum. Bosch, for instance, has a whole line of Tri-tech motion sensors. We’ll also use glass break detectors for the larger glass areas. Glass break detectors provide more reliability than motion detectors alone. Just as important as the sensors that we use, is how they’re wired. Most alarm panels supervise the detectors that are connected to it. This supervision circuit monitors the wire that is connected by adding a small resistor to the end of the wire. If the resistor can be measured, all is good, if the resistor is missing, or the wire is not connected at all, it will send an alarm. No method is foolproof, but it adds another layer of security to the alarm system and will alert us if a wire is damaged before we find out the hard way. As with any system that we design and install, we want the best bang for our buck. We want to maintain the sensor quality because it would be worthless to have multiple false alarms or to miss an important event. However, there are good ways to save money on an installation. One way is to wire efficiently. Traditional or smaller alarm panels need to have a separate wire from the sensor to the alarm panel or input module. However, several systems allow loops of wire to be installed with many sensors on each loop. Since the new facility is much larger, having loops will save over 1,000 feet of wire and the labor to install it. Older and smaller panels also used to require a POTS (Plain old telephone system) line to report to the monitoring stations. Not only is the reporting slower, but who has a telephone line anymore? We will use the IP network to communicate with a central station and pocket the $20 – $30 month that a phone line would have cost. Last, while not a cost-saving measure, but something we will get for free by choosing the right system, is integration with access control. Since the Access control system and intrusion system are on the network, they can talk to each other. With integration, we can see the status of the areas through the access control system, we can turn off the alarm through the access control system when they enter the building, and we can prevent access control from unlocking side doors when the alarm is armed. All of the integration is designed to give more visibility into the system and to reduce false alarms in the intrusion system. We’re all excited about the new building. Some are excited about more space, some are excited about fresh paint, but I’m excited to showcase our capabilities and to redesign the security systems from the ground up. Next month, we’ll talk about the network layout that all the systems use as a foundation and a the video system design. A long term relationship leads to a long term project. Stacy Wessing and Brian Nutt from our Mid Mo team have worked with the City of Columbia for over 10 years on numerous projects, some of which included battery backup systems for their data centers, virtualization software, networking equipment, and downtown surveillance cameras. Brian and Stacy have also worked at a previous employer together with some of the City’s current staff. The City knew we could deliver on a project as promised from previous successful experiences and a solid relationship. 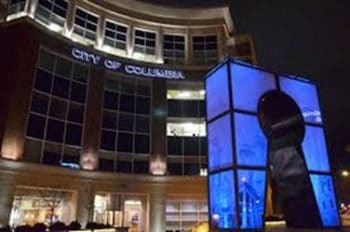 In 2017, the City of Columbia issued an RFP for replacing their existing access control system. The existing system had reached end of life and was falling short in the City’s expectations of functionality, manageability and convergence. The RFP was very detailed on expectations of a new system and Kenton Brothers partner, S2 Security, fit this requirement perfectly. The RFP involved several buildings that must communicate with a centralized controller and provide individual site administration. Upon award of the RFP to KB, several meetings were held to discuss a strategic deployment that would have little to no impact on the City’s day to day functions. The deployment then started with first installing the new controller and setting up schedules and user profiles. The City put together a team to refresh their existing data base and provide a current profile for KB to implement. KB’s own Neal Bellamy was deeply involved with each step of the initial programming of the new controller. The design and build of the controller was a phenomenal success, very few changes were needed and those were rapidly handled by KB’s support team. Then the deployment began of each City property involved. Each site has new nodes, some of them with multiple nodes, that all must communicate back to the main controller. New card readers were installed at every location to enhance the City’s physical security credential. KB moved right along, as pre-staging and pre-programming of the new equipment was completed by KB and the City for each site, a few days before installation. As each site was turned up, users experienced very few changes to their typical means of access, which was the intention all along. To install a new system at each site and have very little impact to the City’s day to day business for their citizens and employees. A weekly conference call was scheduled by KB to review the prior week’s install and, to provide a fully engaged project management team with a means for communication of status updates to the City. The City staff is great at letting KB know any perceived potential caveats so that a plan could be implemented in a timely fashion. In just a couple months on-site, KB is nearing completion of the entire project, which is 3 months ahead of schedule. It takes a great collaboration with the customer, a very detailed plan of execution, and a great team concept. KB’s involvement with the customer at each and every step of this entire project has made it a great success. Special thanks go out to each and every City employee involved and the great installation team at KB. David Potter and Paul Rudkin did a great installation job on every site and, they have made this project a great success for the City and KB. Securing the front entrance of any facility can be challenging. Securing a school’s front entrance is possibly the most challenging project a company like ours can be asked to provide. Parents don’t want to drop their children off in the morning to a building that resembles a prison. It makes sense to make sure people on the inside are safe from external threats. But we have to remember that a facility that is harder to get into is also harder to get out of. In the design phase, we have to always keep in mind that the majority of the users are going to be children and visitors. And they aren’t necessarily familiar with the facility, so the systems put in place have to be easy for them to use. There are situations when the systems we put in place will need to be bypassed to accommodate large groups of people to pass freely in and out of the building. Realistically, with the budgets that schools are faced with, creating a 100% secure front entrance is often not possible. When starting the design process, we must first work on funneling all of the traffic to the front entrance in order to control access to the building. This can be done with fencing to deter trespassing and limit access to secondary entrances. Cameras monitor perimeter entry points and notify staff of any unknown traffic around the facility. The cameras can double as monitoring tools for recesses and transition periods. Door “position” switches can also be installed to notify staff of any unlocked entry points. With these options in place, any unauthorized people would need to proceed to the office in order to gain entry into the building. Recently, front entrances have been designed or remodeled to have a double door style entrance which allows visitors free entrance into a secured vestibule area. This allows front office staff to clearly identify visitors. In the vestibule area, there’s a second set of access controlled doors that lead into the school. There’s also a single access control door that leads into the office. These doors will be outfitted with locking mechanisms that are “fail secure”. This means that if the school loses power, the doors will remain locked. Outside the office entry door there is an intercom system for the visitor to communicate with the office staff. If no threat is detected, the staff has a button to release the door lock, allowing the visitor entry into the office to sign in. This process allows the office staff to keep track of everyone in the building. It also allows the office staff to notify the authorities of any threats with a duress / panic button while securely delaying the threat long enough for the authorities to get there. Kenton Brothers understands all of these situations. 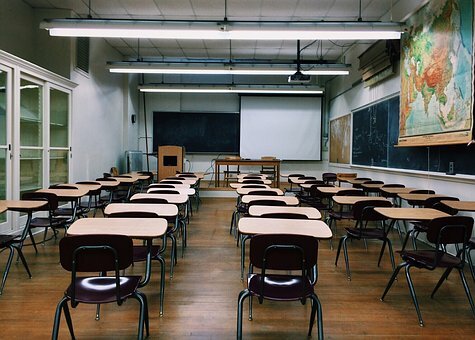 We help schools implement easy-to-use and reliable solutions while working with the staff to put procedures in place for emergency situations. Give us a call to learn more.